Tremble with fear as terrifying ponies swoop through the skies of a modded Skyrim. You kids and your quasi-ironic, gender-inclusive cartoons. Back in my day, men were men (or X-Men, more accurately), and little women watched, I don't know, Princess Gwenevere and the Jewel Riders, or something. Nowadays, though, everyone is all over this My Little Pony reboot - even gamers! In fact, one creative fan has spearheaded an Equestrian invasion of Skyrim, the land known for its fearless Dragonborn warriors. 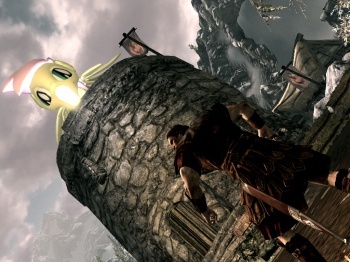 Thanks to his new mod, Skyrim players on the PC can replace all of the game's majestic dragons with a slightly (but only slightly) less menacing Fluttershy. Bah, where's my cane? You can thank modder "zdzichorowerzysta" for this one. Originally appearing on SkryimNexus and currently viewable on "XTremeScope's" YouTube channel, the mod changes only two things: the appearance and sounds of Skyrim's dragons. The video exhibits multiple Fluttershies soaring through the air, murmuring an unenthusiastic "yay", and cheerfully burning the rocky northlands to a charred husk. XTremeScope points out that the mod is not quite perfect, as Fluttershy still bleeds normal dragon blood, but let's be honest: Are you going to stand up to a gigantic fire-breathing pony long enough to make it bleed? Really? The mod is available here if you want to turn your Dovahkiin loose to slay Equestria's greatest monsters. As for me, I'm going to sit here for a good, long while and scratch my head over just how popular this show has become, and why I didn't think of it first.